The biopharmaceutical industry is one of the most research concentrated industries. The expenditure o biopharmaceutical research and development has showcased a dependable growth. 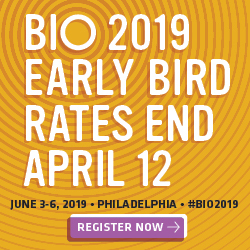 Thus, the global biologics market was valued at an estimated $149 billion in 2010 and is expected to reach $239 billion by 2015, a compound annual growth rate (CAGR) of 9.9% from 2010-2015, states ReportLinker. As most biologics are proteins and hydrolyzed in the gut by digestive enzymes, most new biologics are being introduced for IV administration. However, some biologics may later be reformulated into other handheld drug delivery systems, such as prefilled syringes, needle-free injectors, autoinjectors, and traditional needle-and-syringe delivery. The technology and devices for needle-free delivery of drugs/vaccines has been available in the market for several decades. Although their market penetration has been low, the recent years have seen an increase in adoption, driven by the need for pain-free delivery, according to a March 2012 report from ReportLinker.com, Needle-Free Delivery: Technology and Market 2012-2022. As a result, the report claims that the global needle-free delivery devices market will be worth $2.1 billion by 2016. Currently, the market for needle-free delivery devices is dominated by small medical device companies and academic researchers. These small-scale companies are developing innovative needle-free delivery technologies, with the pharmaceutical companies entering into partnership with the device developers to use the technology for delivery of the company’s drug, states the Reportlinker.com report. The global prefilled syringes market has also been witnessing an increase in mergers and acquisitions. The global prefilled syringes market is expected to grow at a CAGR of 9% over the period 2010-2014. One of the key factors contributing to this market growth is the significant growth of pen injectors. However, sales of duplicate prefilled syringes could pose a challenge to the growth of this market, according to Reportstack.com. A report by London-based business information company visiongain predicts that world prefilled syringe technology revenues will reach $3.9 billion in 2015. Autoinjectors have proven to be one of the most convenient and safe methods for patients to selfadminister their injections. This trend has become even more noticeable as the number of combination products coming to market continues to increase and biopharmaceutical companies seek to diversify the range of drug delivery options for their products. To support this growth, auto injectors must continue to evolve inboth design and functionality. Biologics are also driving the reconstitution market. According to ReportLinker, the inherent instability of biological drugs is a limitation that has a direct impact on the drug delivery sector. Therapeutic proteins must either be stored under special conditions or formulated to retain their efficacy from the time of manufacture until they are dispensed. Liquid protein drugs require refrigeration until dispensed. Alternatively, proteins can be formulated as powders (lyophilization). Lyophilized proteins must be reconstituted prior to injection. 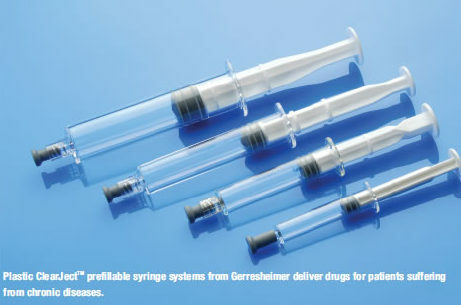 Lyophilized drugs are sold with reconstitution vial systems, or packaged in special injection devices (e.g., pens, needle-free injectors, two-part syringes) that allow reconstitution to take place in the device prior to injection. As biological drugs continue to grow in terms of therapeutics and total prescriptions, the impact of specialty devices will increase. In this exclusive Drug Development & Delivery annual report, handheld injection experts provide their thoughts about the various factors backing the adoption of the devices including ease of use, pain-free delivery, and differentiation for product line extensions. As a global player in healthcare R&D, Battelle has a history in designing and developing handheld drug delivery devices, particularly injection pens and autoinjectors. Battelle’s cross-disciplinary approach uses multiple scientific and engineering capabilities. Through internally-funded research advances and contract R&D services, Battelle has introduced applied innovations and integrated solutions to enhance clients’ injection devices and to develop new drug delivery technologies. With a focus on Rheumatoid Arthritis (RA), Multiple Sclerosis (MS), and diabetes, Battelle is positioned to target chronic conditions that are not well-served by small molecule drugs or require regular dosing that is more conducive to at-home or ex-clinic regimens. Battelle and Zogenix have created a center of excellence for DosePro technology development and testing of client formulations within Battelle’s laboratories, and the firms are planning to complete the development and commercialization of a larger dose (1.2 mL) version of the DosePro. In addition, the Battelle User Research Laboratory (uLab) was recently opened, which allows researchers to conduct usability studies, an activity that has become increasingly critical to medical device and pharmaceutical manufacturers trying to launch new products, explains Ms. Konstantinos. The 4,500-sq. ft. lab features 5 rooms configured to test everything from hardware and software to full-scale interiors for home healthcare settings. The uLab also has an additional 5,000 sq. ft. that can be transformed into any environment necessary. Demand for patient administered injections is increasing within the hand held injection market. Many factors are contributing to the rise in self-administration, including increasing incidence and prevalence of chronic diseases with aging populations, increasing development of targeted injectable therapies by biotechnology companies to treat such chronic diseases, the improving access to healthcare worldwide, and the emerging shift of care from the acute setting to the home setting. With advances in information technology, patients are increasingly empowered in choice of therapy. As such, drug manufacturers aim to select and develop injectable drug delivery systems to improve patient comfort, convenience and preference, which in turn may improve compliance, control healthcare costs, increase brand loyalty, and ultimately improve health outcomes. BD spends a lot of time surveying patients and health care professionals about their acceptance and preference for various delivery systems. The recently launched BD Physiojectâ„¢ disposable autoinjector is a perfect example. Close to 1,000 patients and health care professionals were surveyed and their responses validated product features and design of the system. “In-depth studies helped to uncover unmet needs, identify potential solutions, and validate that the solution met product requirements,” says Dr. Ahmed. In one study, patients with limited hand dexterity and strength revealed that they experience difficulties with their current autoinjector with respect to the forces required to operate the device. 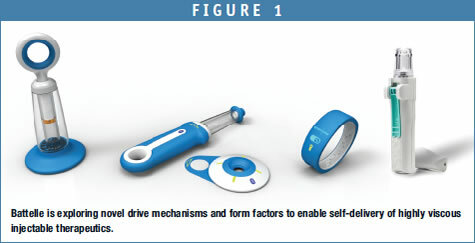 In development of the BD Physioject system, operational forces and patient interaction with devices were optimized by performing usability studies testing acceptance and preference with a range of forces, shapes, and functionalities. This resulted in an ergonomic design which overcomes patient usability challenges. A key finding eventually incorporated into the BD Physioject autoinjector design was that, among the patients tested, the smallest autoinjector design was not necessarily the preferred one, and that ease of use and reliability were rated by patients to be more important than discretion. An issue that autoinjector manufacturers can sometimes face is delivery system malfunction. As a provider of prefilled syringes and autoinjectors, BD mitigates this risk by using quality-by-design (QbD) principlesâ€“fully integrating the autoinjector system with the primary container and the customer drug product. This approach to integration, with systematic assessment of stacked tolerances, enables a robust autoinjector offering with a very low defect rate, claims Dr. Ahmed. To further investigate the acceptance of the BD Physioject system with patients, BD also tested the safety, efficacy and performance of the device compared to a syringe injected by a nurse. Clinical trials show that the BD Physioject autoinjector is not only safe, effective, and patient accepted, but is also perceived to be less painful in comparison. The hand held injection market is in constant evolution. What was a novelty a few years ago is now considered standard in the industry and demand for safer, simpler and more cost-effective solutions, most notably for the home care market – one of the fastest growing health sectors – has pushed drug delivery and medical device designers to come up with new innovations to address these needs. Duoject has been addressing these needs with devices such as Vaccject and E-Z-Link. Vaccject is a cartridge-based delivery device with integrated passive needlestick protection. “It offers a safe and cost-effective alternative to prefilled syringes and provides product differentiation many pharma companies are now looking for in medical devices,” explains Dan MacDonald, Vice-President, Engineering Services for Duoject. While Duoject’s focus has been to offer safe, simple, and easy-to-use medical devices, in the past few years, the company has improved on the human factors aspect of its development by introducing focus studies with end users much earlier in the design process. “This has enabled us to obtain a clearer vision of what the end-user’s expectations are regarding our product and helped optimize our development time and product quality,” says Mr. MacDonald. Development of the patent-pending Vaccject was completed this past year. It is not yet on the market, but is being evaluated by a number of large pharma companies. “The product answers many market needs, such as simplified production process (the drug container is provided separate from the device), optimized cold chain storage and distribution system, and integrated passive needlestick protection,” says Mr. MacDonald. 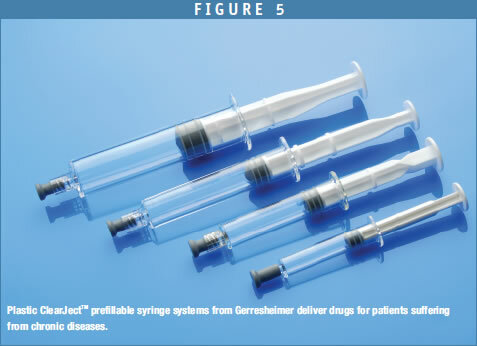 The use of a cartridge rather than a staked-in needle syringe offers the ability to bake on silicone to eliminate sub-visible particles, reduce risk of glass delamination, and absence of Tungsten or needle adhesive to contaminate the drug. “Healthcare professionals liked the fact that the needle in the device was never exposed, neither before nor after the injection and they appreciated that the device did not look like a syringe, greatly improving acceptance by end-users,” he adds. Duoject is in the process of filing a 510(k) for the device and is working with leading equipment suppliers to optimize manufacturing process for high-volume production. Duoject’s primary therapeutic focus area when developing Vaccject was high-volume vaccines, but quickly realized that pharma companies could benefit by using this type of safety delivery technology for other therapeutic drugs. “It became clear that Vaccject is also a perfect solution for home care use as well as pediatric applications where the use of a standard syringe is in some cases a harder sell to the end user or patient,” says Mr. MacDonald. Duoject continues to focus on reconstitution devices and is currently completing development of PenPrep EVO, a cartridge-based reconstitution device for multi-dose applications in lyophilized drug vials, for use with standard pen injection systems. The device is an improvement over Duoject’s current PenPrep XR device. PenPrep EVO will be available to the industry in early 2013. The growing use of biotech and biosimilar drugs and the global effort to reduce health care costs has driven companies that are introducing new injectable drugs or biologics to increase patient compliance and enhance sales and market success through improved drug delivery devices. The need also arises for low-cost, safe, patient compliant, and easy-to-use autoinjectors that will improve treatment efficacy. Elcam Medical is addressing the current and future market needs with its autoinjector product line. These include ready-to-market devices like the Flexi-Q PFS autoinjector for drugs in prefilled syringes, and the Flexi-Q DV autoinjector platform for drugs in vial either in solution form or in lyophilized form requiring reconstitution. Flexi-Q PFS is expected to reach the market in the next 1 to 2 years and has a market sales potential of more than $10 million per year. The Flexi-Q DV has received 510(k) clearance by FDA. Elcam autoinjectors in development pipeline include the Flexi-Q HV disposable autoinjector for low-to-high viscosity drugs. This proprietary platform has a mechanism preventing any impact on the glass prefilled syringe, enabling use of extremely strong injection springs to deliver high-viscosity drugs while using small-diameter (high gauge) needles at short injection times, explains Mr. Daily. The second autoinjector is the Flexi-Q MU, a reusable electronic autoinjector for low-to-high viscosity drugs. It is designed to be used with various drug primary containers. In the last year, Elcam Medical has made progress in a development project with one of the top-10 pharma companies customizing its Flexi-Q PFS autoinjector to the client’s specific requirements. Other feasibility projects are on-going with largeand medium-size US-based and EU-based pharma and biotech companies, including the Flexi-Q PFS, Flexi-Q DV, and Flexi-Q MU autoinjectors. Elcam Medical is currently considering licensing and joint venture agreements, partnering with some of the leading medical device players. Alongside the standard injection devices such as glass and plastic prefillable syringes, there is an ongoing trend towards customized injection systems and the use of autoinjectors and pen systems. This is partly driven by the fact that an increasing number of drugs to treat chronic diseases are now available to patients on a self-administration basis and these patients need solutions for simple and safe administration, says Claudia Petersen, Director Business Development, Gerresheimer GmbH. Gerresheimer’s expertise in glass and plastic primary packaging component and system manufacturing addresses that need. Its Medical Plastic Systems Division manufactures products such as pen systems for diabetes drug administration, inhalers, autoinjectors, and other customized injection system solutions. The Tubular Glass division is a leading player in the market for glass (RTF®) and plastic (ClearJectTM) prefillable syringe systems. Specific accessories such as tamper-evident luer lock closure (TELC) for glass prefillable syringes satisfy market requirements of increased safety and tamper evidence features. The glass and plastics maker is seeing growing importance for innovative solutions to improve current standard injection devices and new approaches because of the success of bioengineered drugs. “These biotech drugs often have very large molecules that are associated with specific requirements regarding the chemical and functional properties of the container/closure system,” says Ms. Petersen. This market segment includes new drug classes such as DNA vaccines and siRNA-based drugs and it will continue to grow in the future. “Developing appropriate packaging solutions for each of these drug classes is associated with many exciting challenges,” she says. The handheld injection market is being driven by pharmaceutical companies looking to differentiate their product and provide a patient friendly self injection experience. The increasing number of self-administered products being marketed combined with increasing incidence of diseases requiring self-injection, is rapidly expanding the need for self injection devices. The need for pen injectors is increasing significantly as diabetes continues to be one of the leading diseases requiring self injection. If current trends continue, the CDC estimates that as many as 1 in 3 adults could have diabetes by 2050. Haselmeier provides pen injection devices for self-administration with experience in designing and manufacturing injection devices to meet patient needs. This year, the company introduced the i-pen2, an all-plastic reusable pen based on its metal ipen design. “By being all plastic, it provides a cost-effective pen platform when cost is an important issue,” says Robert J. Kilgore, Vice President Marketing and Business Development at Haselmeier. “It features the same function, durability, and accuracy of our metal i-pen. 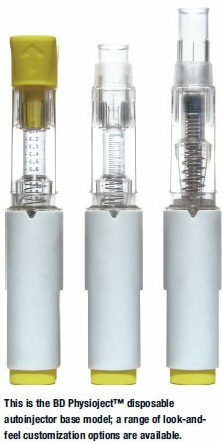 The i-pen design has been well accepted by pharmaceutical companies around the world for delivery of insulin and other biotech products requiring a high quality reusable pen injector.” The i-pen is available as an existing design platform or may be customized to meet individual customer requirements. Axis-D is Haselmeier’s disposable pen platform. This is an all plastic, variable dose pen featuring a sliding dose indicator window to make dosing easier for the patient. 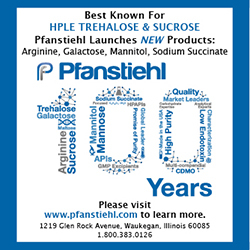 “Haselmeier continues its focus on the design and development of pen injectors using a 3mL cartridge as the primary drug container,” explains Mr. Kilgore. These include variable and fixed-dose devices in a disposable or reusable format. As the market for self-injection devices continues to grow, the need for increased testing and documentation has also increased. Some of this is a result of increased regulatory review but it is also driven by pharmaceutical and device companies striving to ensure that patients receive a self-injection device that is accurate, easy-to-use and has a low potential for mishandling. In the context of increasing homecare treatments, legislations are evolving to provide more safety surrounding parenteral devices. 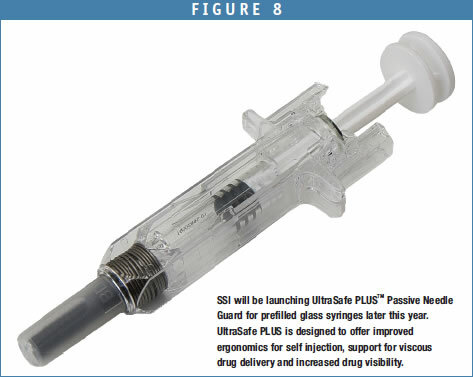 Rexam Healthcare has developed a safety device as an add-on to glass prefilled syringes. Its Safe’n’Sound® is a fully passive device (meaning no additional gesture is necessary for the usual injection procedure from the nurses or patients). Safe’n’Sound offers complete protection of the needle after a smooth injection and also ensures that the full dose of the drug contained in the glass syringe has been delivered. A needleshielding automatic process ensures a reliable injection while reducing noninjected volume. Over the last year, two versions of Safe’n’Sound have received a 510(k) approval from the FDA Safe’n’Sound for 1mL-long stacked needle syringes and Safe’n’Sound for 1mL-Luer syringes. Rexam is focusing on large-scale industrialization of the Safe’n’Sound in currently developed versions of the system, and on the development of new versions of the safety device in different sizes. New versions will match demands for different volumes. Safe’n’Sound is compatible with glass syringes on the market (Schott, Gerresheimer, Nuova Ompi, and BD) and can be customized for better patient handling (i.e. extended finger flanges). Safe’n’Sound is currently on the market, with a strong patent protection, positioned to respond to the increasing demand of safety from the authorities. Rexam will present new versions of Safe’n’Sound in 2013. Safe’n’Sound is targeting all medication in prefilled glass syringes and customization has been proposed for specific pathologies such as Rheumatoid Arthritis. The handheld injection market is being driven by the increasing need for convenience, efficiency, and safety in delivery of injectable drugs. 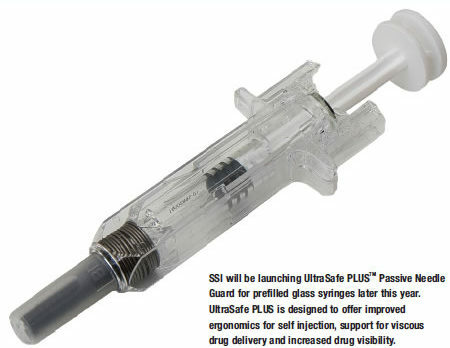 Safety Syringes Inc. (SSI) is a leading provider of antineedlestick safety devices for prefilled glass syringes. Its newest product developments reflect the need for more injection comfort, especially for those end-users that inject at home and have impaired dexterity, explains Sarah Baer, Marketing Product Manager for Safety Syringes Inc. The company is focused on providing innovative anti-needlestick devices that provide simplicity, intuitive ease of use, and streamlined assembly into existing packaging lines. SSI recently launched the Add-On Finger Flange for its UltraSafe Passive® Needle Guard. The Finger Flange is designed to provide improved injection comfort for self-administrating patients, especially those with reduced dexterity. SSI UltraSafe Devices are used in a range of therapeutic areas including immunology, oncology, vaccine delivery, anti-thrombotic, contraceptive, anemia, and more. “SSI will continue to develop advanced safety devices to support the growing needs of our customers including innovative solutions for delivery of complex biotechnology drugs and greater support for patients performing self injection,” says Ms. Baer.